The Australian/Briton Frederick Hasselborough accidently discovered Macquarie Island in July 1810, while looking for new sealing grounds. He claimed it for Britain and it was annexed by the colony of New South Wales, and was named after its governor Lachlan Macquarie. Macquarie Island is well known as a wildlife sanctuary, and came under the administration of the Australian Antarctic Territory in 1947. It was recognised as a World Heritage Site in 1997. 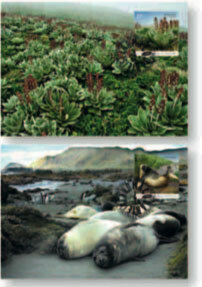 Macquarie Island and its wildlife have featured on a number of AAT stamps. 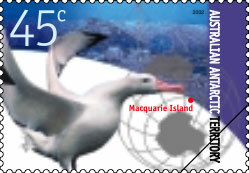 The current postmark for the island (top right) shows a pair of Royal Penguins. 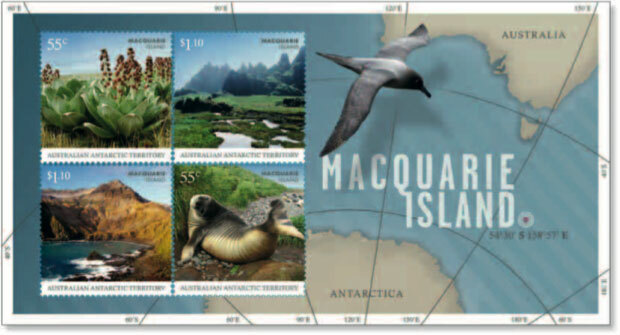 The Research Station issue of 2002 (bottom right), shows the position of Macquarie Island in relation to Australia - the island is actually closer to New Zealand, then it is to Australia! The release date for this issue has changed a number of times. The initial date of issue was 29 June, the day after the (then proposed) 60c rate rise. The issue date was then changed to 22 June in Stamp Bulletin No. 304. However, soon after the ACCC approved the 60c rate rise, the issue date was changed to 26 October. 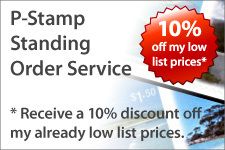 Australia Post has confirmed this is because of the rate rise, and to allow time to print the stamps with 60c/$1.20 values. They have also confirmed that no 55c/$1.10 version of the stamps have been printed. 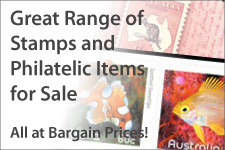 Until we see the September-October Stamp Bulletin it is assumed that stamps of the same value will be printed in se-tenant pairs. The 60c and $1.20 stamps will be issued in se-tenant pairs - the stamps will not be issued in strips of four. 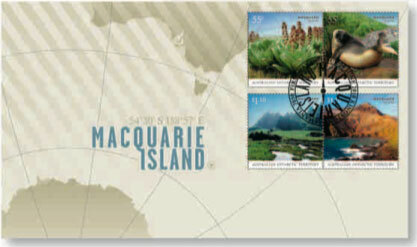 Miniature sheets show the position of Macquarie Island in relation to Australia and Antarctic, and include a unique block of four. 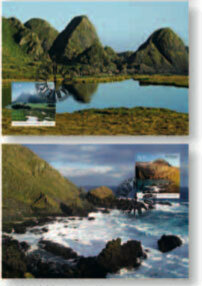 The sheet's height of 85 mm means that the miniature sheet does not need to be cut down for first day covers. Four maximum cards will be released showing images related to the stamps. 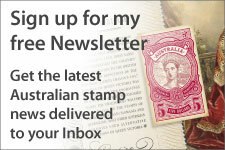 Australia Post, Australian Stamp Bulletin, No. 265, June-July 2002, No. 273, January-February 2004, No. 304, May-June 2010, No. 305, July-August 2010.